Before UBC staff and faculty left for the winter break, they set up the campus to save big on energy and greenhouse gas emissions. This past December, departments across campus joined together to reduce UBC’s environmental footprint over the winter holiday. By making a series of energy saving actions across campus, the impact they created over the nine-day break was significant: saving $20,500 in energy costs, 356,900 kWh (enough to run 4,350 refrigerators over the same period), and 13 tonnes of carbon emissions (or 10 round trips between Vancouver and Ottawa)! This was all part of the 2016 Seasonal Shutdown Campaign, a campus-wide effort to turn down the heat in buildings and engage staff and faculty to complete energy-saving tasks. The campaign involved people across several departments working collaboratively to achieve the savings, including Energy and Water Services’ Building Systems Manager, Phil Brussé, who worked with Facility Managers at Building Operations to dial down the heat in buildings across campus. “As a majority of the energy consumed in buildings is due to heating and cooling systems, by turning down the heat when buildings are not in use we can achieve significant energy savings and reduce greenhouse gas emissions”, says Blair Antcliffe, Energy Engineer with UBC Energy & Water Services. Teams of faculty and staff in multiple departments took part by switching off electronics, unplugging small appliances, turning off lights and closing windows and blinds. 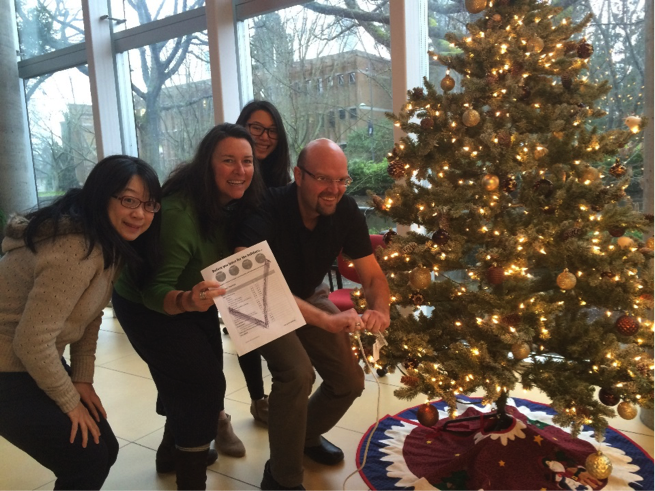 “Our units joined forces and had fun working through the Seasonal Shutdown list and checking it twice!” states Kat McGrath, Sustainability Coordinator and lead of the UBC Library team. Overall, the campaign involved over 30 buildings, with 35 departments and 1,300 people. Three lucky teams won the prize draw for participating: Applied Science Dean’s Office – Engineering, Liu Institute for Global Issues, and Microbiology & Immunology at Michael Smith Laboratories. Seasonal Shutdown is organized by Campus + Community Planning, Energy & Water Services and Building Operations, with support from BC Hydro’s Energywise program. The campaign contributes to UBC’s Climate Action Plan and energy reduction goals by engaging and educating staff and faculty about best practices in energy conservation. More information about the campaign can be found online.